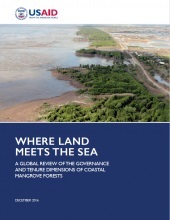 Authors: Rotich, B.; Mwangi, E.; Lawry, S.
This report provides a synoptic analysis of the legal and governance frameworks that relate to the use and management of mangrove forests globally. It highlights the range of challenges typically encountered in the governance and tenure dimensions of mangrove forest management. This assessment forms part of a broader study that includes national-level assessments in Indonesia and Tanzania. It was carried out under the USAID-funded Tenure and Global Climate Change Program. The report provides information on the challenges for mangrove rehabilitation and restoration, legal frameworks for the governance of mangroves, mangrove governance and tenure in practice, and lessons in mangrove governance for policy and practice. Primary findings from this assessment show that authority over mangrove forest management is overwhelmingly vested in state institutions and that mangrove protection is a central objective. Given the ambiguous role of mangroves situated between the land and sea, the configuration of state authority for mangrove management is quite complex. 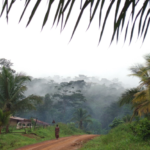 In some countries, there is fragmentation of responsibilities across two or more agencies such as forests, fisheries, environment, and wildlife. This contributes to a high level of segmentation and jurisdictional ambiguity. 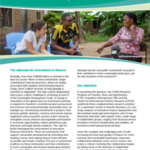 Frameworks and mechanisms for enabling multi-sectoral coordination across agencies and governance levels are uncommon, and where they exist, they are difficult to put into practice.